Stretch Or Splat? How A Black Hole Kills You Matters ... A Lot Over the past year, a roaring debate has erupted among physicists about what exactly would happen if you fell into a black hole. 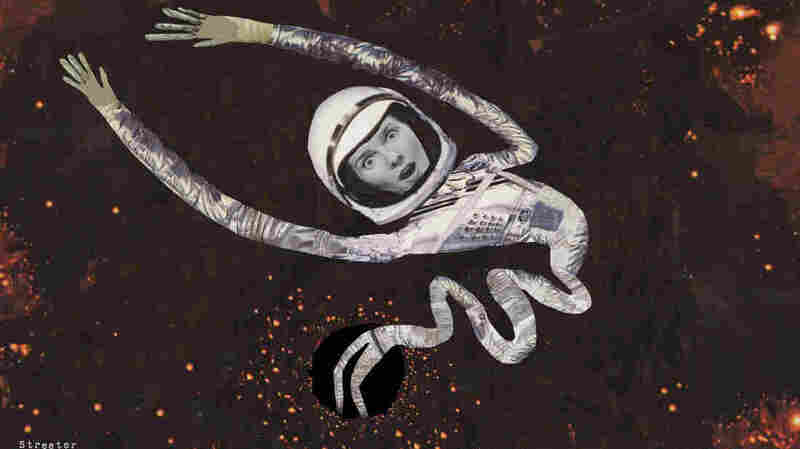 Would it be "spaghettification," or a quantum firestorm and oblivion where space ceases to exist? The answer has big implications for fundamental physics. It could rightly be called the most massive debate of the year: Physicists are locked in an argument over what happens if you fall into a black hole. On one side are those who support the traditional view from Albert Einstein. On the other, backers of a radical new theory that preserves the very core of modern physics by destroying space itself. Regardless of who's right, the new take on black holes could lead to a better understanding of the universe, says Leonard Susskind, a physicist at Stanford University. "This is the kind of thing where progress comes from." Black holes are regions of space so dense that nothing, not even light, can escape. Our hypothesis is that the inside of a black hole — it may not be there. Probably that's the end of space itself. There's no inside at all. There's a long-standing view about what would happen if you fell into one of these holes. At first, you're not going to notice much of anything — but the black hole's gravity is getting stronger and stronger. And eventually you pass a point of no return. "It's kind of like you're rowing on Niagara Falls, and you pass the point [where] you can't row fast enough to escape the current," Susskind says. "Well, you're doomed at that point. But passing the point of no return — you wouldn't even notice it." Now you can't get out. And gravity from the black hole is starting to pull on your feet more than your head. "The gravity wants to sort of stretch you in one direction and squeeze you in another," says Joe Polchinski, a physicist at the University of California, Santa Barbara. He says the technical term for this stretching is spaghettification. "It'd be kind of medieval," says Polchinkski. "It'd be like something on Game of Thrones." In Einstein's version of events, that's the end. But Polchinski has a new version of things: "Our hypothesis is that the inside of a black hole — it may not be there," he says. So what's inside the black hole? Nothing, Polchinski says. Actually even less than that. "Probably that's the end of space itself; there's no inside at all." This "no inside" idea may sound outrageous, but it's actually a stab at solving an even bigger problem with black holes. According to the dominant theory of physics — quantum mechanics — information can never disappear from the universe. Put another way, the atoms in your body are configured in a particular way. They can be rearranged (radically if you happen to slip inside a black hole). But it should always be possible, at least in theory, to look at all those rearranged atoms and work out that they were once part of a human of your dimensions and personality. This rule is absolutely fundamental. "Everything is built on it," says Susskind. "If it were violated, everything falls apart." For a long time, black holes stretched this rule, but they didn't break it. People thought that if you fell into a black hole, your spaghettified remains would always be in there, trapped beyond the point of no return. That is, until the famous physicist Stephen Hawking came along. In the 1970s, Hawking showed that, according to quantum mechanics, a black hole evaporates — very slowly, it vanishes. And that breaks the fundamental rule because all that information that was once in your spaghettified remains vanishes with it. This didn't seem to bother Hawking. ("I'm not a psychiatrist, and I can't psychoanalyze him," Susskind says.) But it has bothered a lot of other physicists since. And in the intervening years, work by another theorist -- Juan Maldacena, with Princeton's Institute for Advanced Study — seems to show that Hawking was wrong. Information has to get out of the black hole ... somehow. But nobody knows how. So Polchinski took another look. "We took Hawking's original argument," he says, "and very carefully ran it backwards." And Polchinski and his colleagues found one way to keep things from vanishing when they fall inside a black hole — they got rid of the inside. By tearing apart the fabric of space beyond the point of no return, the group was able to preserve the information rule of quantum mechanics. In this version, anything falling into a black hole is instantly vaporized at the point of no return, in a fiery storm of quantum particles. Particles coming from the hole collectively carry away any and all information about the object that's falling in. So in Polchinski's version, when you fall into a black hole, you don't disappear. Instead, you smack into the end of the universe. "You just come to the end of space, and there's nothing beyond it. Terminated," Susskind says. All the information once contained in your atoms is re-radiated in a quantum mechanical fire. This new version seems too radical to Susskind. "I don't think this is true," he says. "In fact, I think almost nobody thinks this is true — that space falls apart inside a black hole." Even Polchinski still feels that black holes should have insides. "My gut believes that the black hole has an interior," he says. But, he adds, nobody's been able to disprove his hypothesis that it doesn't. "Every counterargument I've seen is flawed," Polchinski says. Susskind agrees: "Nobody quite knows exactly what's wrong with their argument — and that's what makes this so important and interesting." And as crazy as it sounds, this is progress. In the year ahead, Susskind hopes someone can find the flaw in Polchinski's argument, just the way Polchinski found a flaw in Stephen Hawking's argument. But it will be awhile before we understand black holes inside and out.